I’ve got a yummy and hearty new soup recipe for you that’s SO easy to make! 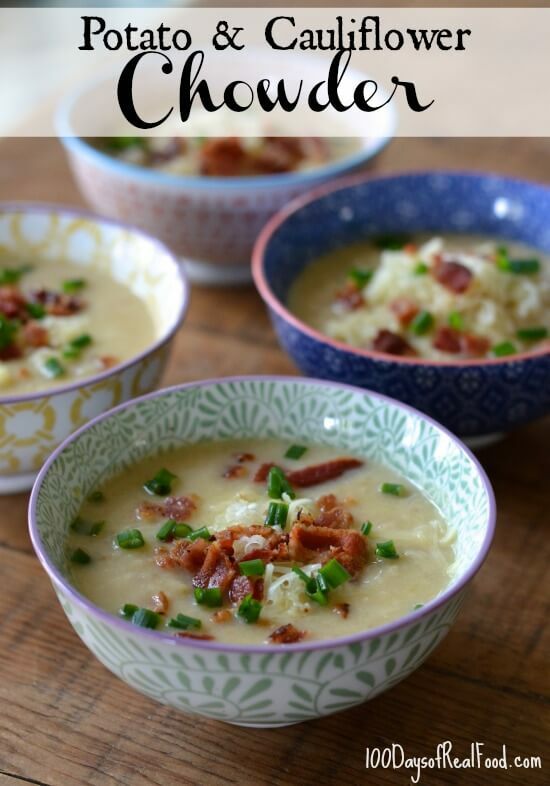 And the best part is that this Potato and Cauliflower Chowder recipe makes enough for leftovers (unless you’re cooking for an extra big family, of course). recommended toppings: grated cheese, sliced green onions, and more bacon of course! 1. In a large soup pot over medium heat, cook the bacon pieces while stirring, until golden brown, about 3 to 4 minutes. 2. Add the diced onion and minced garlic to the pot and cook while stirring for 1 more minute. 3. Add the cauliflower florets, potato chunks, and broth to the pot and bring to a boil. Turn the heat down to a low simmer and cook until the cauliflower and potatoes are tender when pierced with a fork, about 15 minutes. 4. Dip a hand immersion blender into the pot and puree most but not all of the soup. Alternatively, pulse in a counter top blender until mostly smooth with some chunks remaining. 5. Stir in the cream, butter, salt, and pepper. If desired, top with grated cheese, sliced green onions, and more bacon, and enjoy! Freeze the leftovers in individual portions for a rainy day.